Babeselle has been having problems that the doctor has been unable to diagnose. 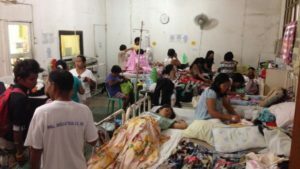 He referred her to the hospital in Dipolog, a city with a population of 130,759, to have tests run at the laboratory located in the hospital. They ran tests there but couldn’t find anything conclusively because they lacked an advanced laboratory needed to do the tests required. 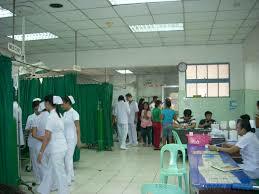 They, in turn, referred them to the hospital in Dumaguete, located on Negros Island. It is known as a university town because of the 4 universities located in the city. 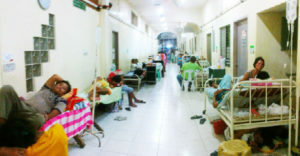 Here are a couple pictures of the Dumaguete Hospital. 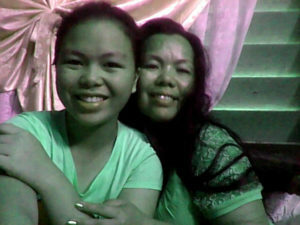 She and her mother then returned home. At school, a government doctor was there for some reason, and a teacher had him check Babeselle. He said that in addition to the blood testing for the problem they had been trying to discover, that he felt that she needed an ultrasound for the constant abdominal pain that she has experienced for most of the last 3 months. 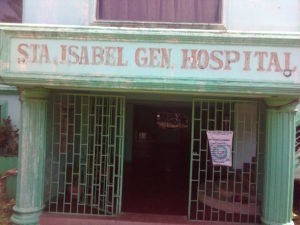 There was the matter of funding as there was an expected 2 or 3 days of inpatient testing at the hospital, in addition to travel and food expenses. We started raising funds. We raised enough to send her and her mother to get the testing done. We are still raising the funds for treatment when we find out what that might be. 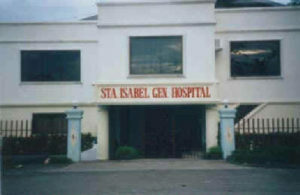 Early Monday morning their time, they took the boat to Dumaguete to admit her in the hospital. I have tried to contact them several times but have been unsuccessful so far. We ask for your continued prayers for her. This has been ongoing intermittently for over a year, and the last month almost constantly. She has missed so much school due to this that I am hoping that she doesn’t fall behind in her schoolwork. If you wish to send a donation to help with this medical need, please click on the support link. Your help is certainly appreciated. She sent a picture of her and her mother on the 13th. She had used the webcam as a camera to take the picture. I had asked her to take one when they could get online next time.